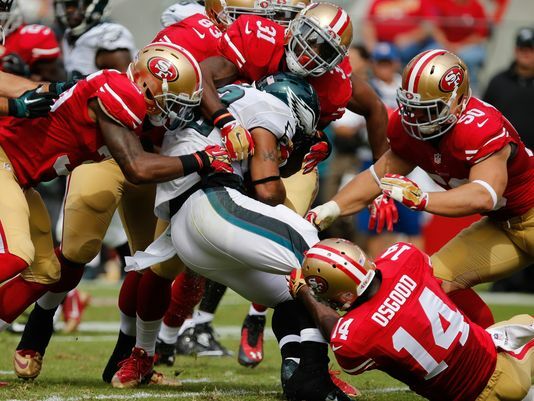 The Eagles-49ers game on Sunday was not what anyone had in mind. The 49ers had blasted opponents in the first half, only to give up tons of points and two games in the second half; that was their M.O. in the first three weeks. Meanwhile, the Eagles had a tendency to explode in the second half, staging magnificent comebacks, and entering week 4 undefeated. It seemed like the script for this game was all set. Unfortunately, no one told the 49ers defense that. When the Niners gave up two special teams touchdowns, and a pick six, to the Eagles, it looked like they were done for. Kaepernick had been looking impotent, the defensive side seemed to falter at the worst possible moments, and Harbaugh looked like he was going to have a stroke on the sidelines. Then, though, something happened: someone, I’m not sure who, but someone remembered that they have a running back named Frank Gore, and that the 49er defense was actually really good. Suddenly, everything clicked. Gore took the rock and ran with it. He didn’t always get the first down, but he was strong enough to get the defense to buy it more often than not. Kaepernick did what he had to do: he did not make mistakes, got the ball to his playmakers, and never let up. Finally, the 49ers defense made a statement by not letting the Eagles offense score a point, and by constantly harassing Nick Foles, and by holding the Chip Kelly up-tempo machine to 56 plays. For the 49ers, this win means a lot. It shows that the season is not completely lost, which a 1-3 record would have meant. It means that they might have righted the ship, that maybe Harbaugh can regain some control of the locker room, and that maybe the 49ers can make a serious run at a playoff spot. 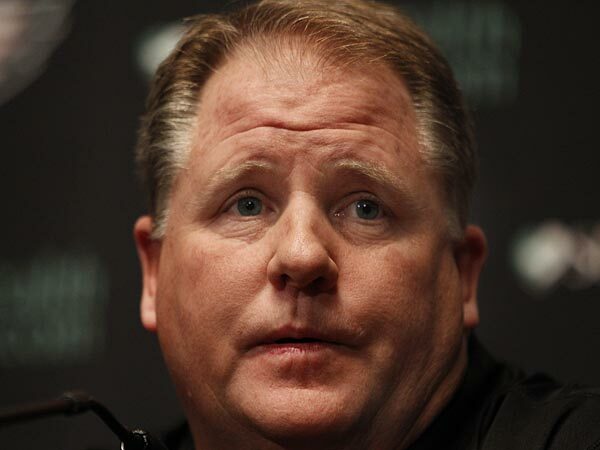 It also reinvigorated the 49ers defense, by stopping a potent and fast offense; notably, this was facilitated because Harbaugh ran defensive drills faster than Chip Kelly actually runs them, meaning that the defense was properly prepared and able to maintain constant pressure. On the other hand, the Eagles are now 3-1, which ain’t bad, but given that the NFC East suddenly has some life to it, and that Eli Manning and Tony Romeo are both re-energizing their squads to contend this season, at least for the coming weeks, the Eagles need to re-group. They are more than capable of this, and will succeed. However, for both teams, the key is to know what works, why it works, and do everything to make sure it succeeds.